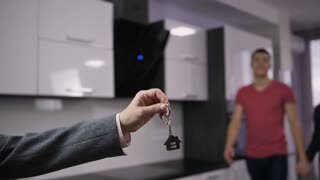 Slow motion of realtor's hand holding house keys and young smiling couple approaching real-estate agent and taking keys. Happy married woman and man embracing and thanking for newly purchased house. Midsction of young happy couple getting new house keys from realtor's hand. Smiling woman embracing her husband, taking the key with wooden house keyring, smiling and shaking it in front of her.